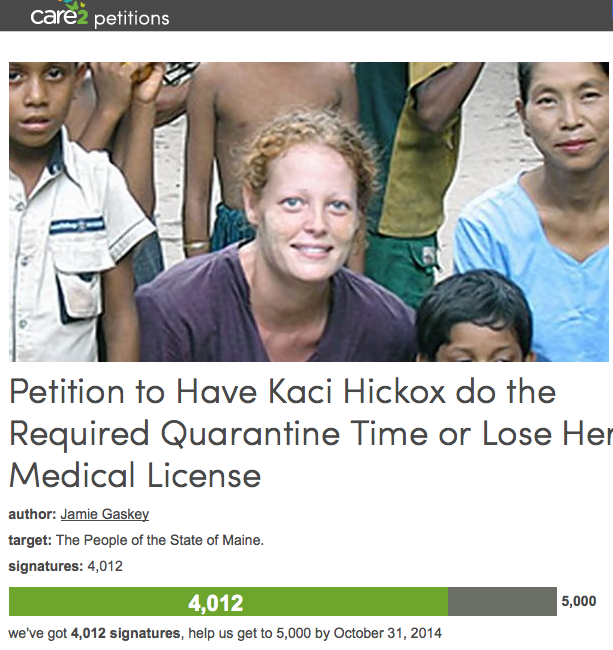 Gateway Pundit pointed us to this petition: Petition to Have Kaci Hickox do the Required Quarantine Time or Lose Her Medical License. As a Nurse I am disgusted that this selfish Liberal Nurse would put other Americans at risk instead of doing a simple 21 day quarantine.If she exposes someone and they get sick criminal charges should be bought to bare on this EVIL women! Ms. Hickox needs to remember that her expertise is in nursing, not medicine, not infectious disease. If I need a catheter placed or an I.V. line started I would want someone in her profession. If I need a medical work up, diagnosis and treatment, I'd want someone trained in medicine. She needs to stick to what she knows. However after this recent behavior, I don't feel she possesses the mental capacity and character to practice her profession anymore. What a brat... "It's all about ME" and to hell with everyone else.. This woman has already shown that she should be stripped of her nurse's license.. There's more to being a nurse than a head full of knowledge.. Her rights were violated?! What about my rights to feel secure walking around? What court do I go to fight for my rights? Yes, she isn't contagious right now, but I think her temper tantrum and "I'll sue" attitude is just as scary as ebola! She should lose her nursing license. Who in the USA that has read this story and seen her face would ever want her to be their nurse...She would always put her self- interests above the patients. For her to say she is Ebola free just shows the ignorance of her medical knowledge...As a former nurse, I will never forget her name nor that smiling face...She took an oath for the safe care of others. Kaci has brought shame to nurses everywhere! Kaci Hickox you are wrong. You don't know if the virus is in your body until the 3 weeks has passed. Infectiousness is not binary, it is analog. You are embarrassing yourself and all medical professionals with your grandstanding and apparent ignorance. 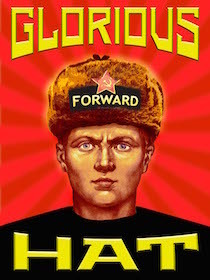 Even worse, you are putting your own interests ahead of those you claim to serve. You are not a special snowflake Hickox, you were in contact with ebola patients do the MANDATORY 21 days. Her "right" to ride a bicycle does NOT trump the thousands upon thousands of peoples rights to FEEL safe!! Staying home is the right thing to do for your fellow Americans - whether its medically founded or not. What makes her think she has a right to take away our feeling of safety and security? That is not only selfish, but down right unAmerican!! What a disgrace to the nursing profession and disrespect to the American people. I am a nurse and believe that in making her own rules, she has betrayed the nurses oath to do no harm as she has intentionally caused mental and psychological stress to many persons in the public domain. Keep in mind, this is NOT about her getting others sick, it is about her following the rules set, and for breaking her nurses oath. The most selfish person in America right now! Would it kill you to spend a few damn days at home?! You are the very reason there needs to be mandatory quarantines!!!! Too many smug self righteous people that think they are above everyone else. Why do we EVEN have laws if renegades such as Hickox defy them? It speaks VOLUMES that someone like Hickox decides that laws are for everyone else but her and then Grandstands on her bicycle. Spoiled, Self Indulgent Brat. As a nurse I am appalled at her arrogance and disregard for seriousness of this Ebola outbreak. She is not showing concern for anyone but herself. I am a nurse and to see another nurse show such blatant disregard for the law and U.S. citizens is just sad to see. It is "all about me" with her. As nurses we have an obligation to be role models and leaders to ensure the safety of our patients and the public. Ms Hickox embodies neither. Why Are All Ebola Patients Obama Voters? The Captain Wears the Hat! Did Obama's Hope and Change Pass You By?